In the last decade, the Occupy Wall Street movement and the U.S. Supreme Court cases Citizens United v. FEC and Burwell v. Hobby Lobby Stores have shed light on the power of corporations over American elections and the state itself. 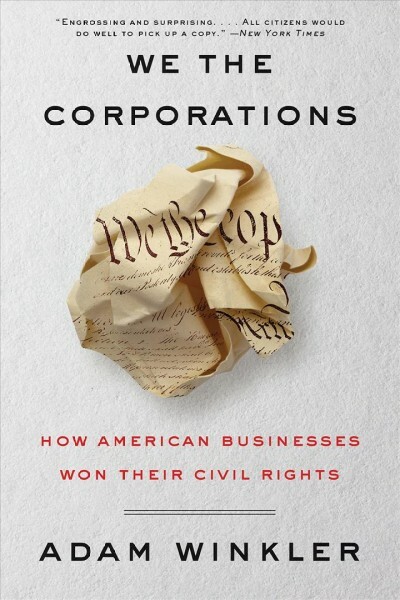 In We the Corporations, Professor Adam Winkler (UCLA law) delves deep into the history of corporations in the United States and looks at how they have increasingly become more powerful. Winkler uses the phrase “civil rights” to juxtapose the current corporate rights movement against other movements for rights of oppressed peoples, such as minorities and women. Winkler starts with the Virginia Company and the early history of what would become the United States then takes the reader on a tour of American law through current times. 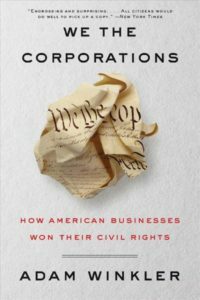 While a corporation never marched on Washington, Winkler argues they used the strategies of other civil rights struggles: civil disobedience, test cases, and novel legal claims made in a purposeful effort to reshape the law.